During a weather net or other type of ARES/RACES activity, I’m typically the the person behind the microphone, operating as net control and keeping things running smooth. In my years as a net control operator, one skill I’ve picked up is the use of break tags to streamline operations and increase net efficiency. For years, it was custom practice to use the word “break” or your callsign to break into a conversation during a net. While “break” is a great way to catch the net control’s attention, it doesn’t convey any information. Hearing “break”, how does net control know of the urgency of the situation, or if the other station just wants to share side information. Break Tags eliminate the ‘breaker’ confusion that happens on a net . Break tags consist of seven simple words or your callsign to indicate the content of your message to net control. In a net situation, using the tag gives net control operator the ability to asses the urgency of the other party’s communication- deciding to let them break in, or standby until the current situation has been resolved. I can safely say that I’m not the inventor of the break tags. I was first introduced to them back in 2006. One of the earliest mentions I could find of the break tag was by Rick Palm, K1CE, when he referenced the use of break tags in his ARES newsletter in November 2005. That article cited Rod Lane, N1FNE as one of the creators of the tags, but upon further research, it seems to be a collaborative effort by several hams in the ARRL Connecticut Section. 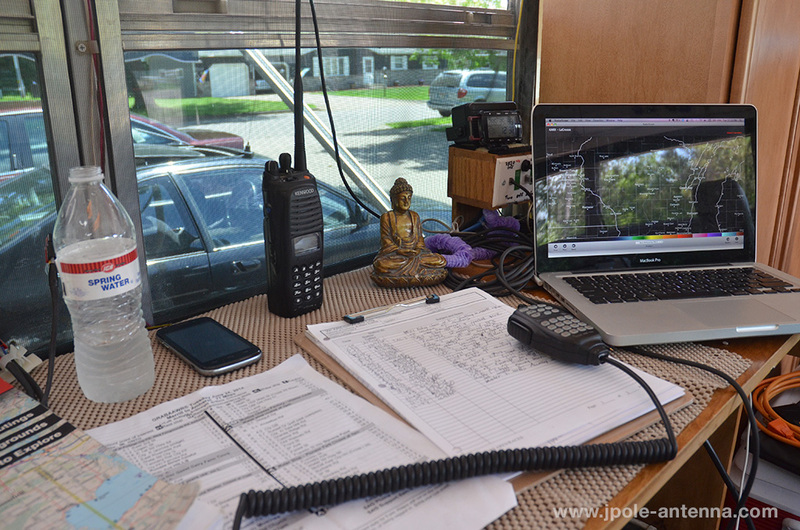 Running net control for a multi-day bicycle tour. Useful tools include maps, cue sheets, weather radar, and of course hydration. I’ve participated in many net activities that have greatly benefited from using break tags, and have brought the practice into our own ARES/RACES activities. The tags are simple, just seven one word phrases that can be used to get the attention of the net control concisely and efficiently. Answer: To be used when you have the definitive answer to a question currently being discussed on the air. Question: To be used when the answer of a question can’t wait; for example, when the mayor is standing next to you and requesting you to get information using your radio. Info: To be used when information needs to be transmitted rapidly but is not related to what is being said on the air; for example, if an event that net control needs to know about is going to happen in the next few seconds or if waiting for the end of an exchange will negate the value of the information. Priority: To be used to report an important but non-life threatening situation such as a fender-bender that just happened. Medical: To be used to report a minor medical incident that affects the operator in some way; for example, having to leave his/her post for a few minutes to walk someone with a minor cut over to a med tent. Emergency: Only to be used to report an ongoing life or property threatening or damaging incident. Your Call Sign: An indication that the operator has traffic that can wait and does not require the cessation of the ongoing exchange. This tag is an expectation to be put on hold and in queue for transmission. Using break tags takes very little practice. I’ve found that handing our index cards with the tags listed on them and briefing operators on the use of tags is all it takes. The phrases come naturally and their use will certainly facilitate a more efficiently run net. 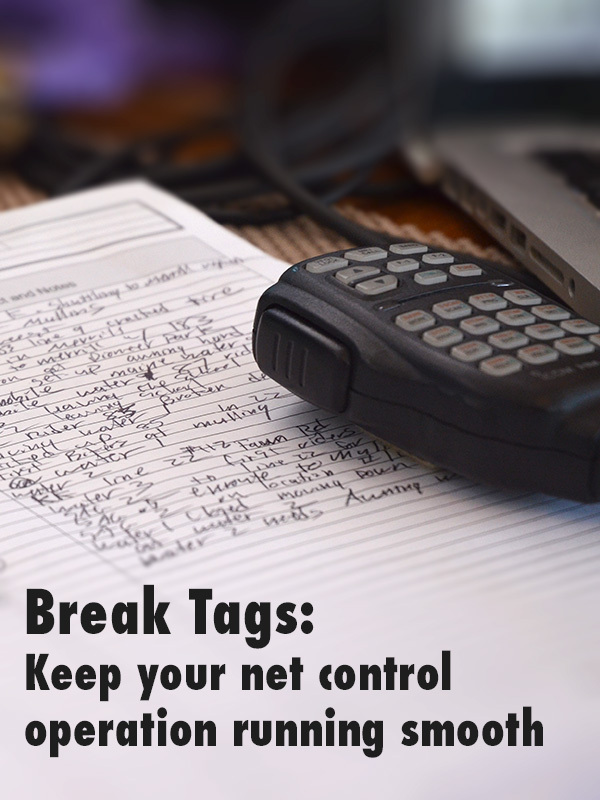 Break Tags eliminate the 'breaker' confusion that happens on a net by using seven simple words or your callsign to indicate the content of your message to net control.